Well this is now the second day sitting out the March snow storm. Mother nature had tried to fool us last night by giving us a beautiful clear night and excellent, dancing Northern Lites. When we went to bed last night, the winter freighting caboose was so well lit due to the full moon and Northern Lites that it was almost hard to fall asleep. I thought this morning when we got up we would make it to the lodge today and be able to unload the sleighs for sure. But we couldn't, we just had to wait out the storm and it was well worth the pictures and time that we are getting to relax. At noon today mother nature gave us a window of opportunity to start freighting again but it was with freezing rain and snow blind conditions. I could see almost 5 miles across the open lake but could not see the blown in trail that was made by "THE HOOD" on the trail break. What a time I had trying to pull the Southern stone boat. 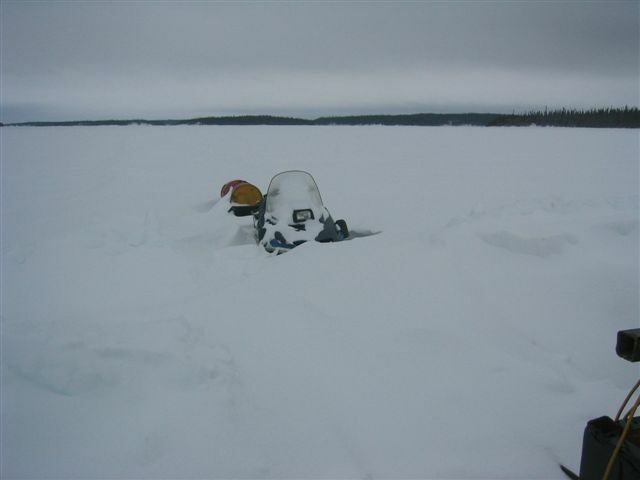 When weather was cold it pulled very hard but it could be pulled, but now that it is rainy and warm, the Southern stone boat wouldn't budge due to the poor design of the wide skis. So now I have to plow the snow right down to the ice to make this thing slide, oh well more fun I guess. So now I have to plow 3 feet of hard packed snow with the world's smallest cat, but this is no problem. I start by plowing a head for about 5 kms and let the cat plow whichever way it wants to get through the hard drifts. When the little cat hits the hard snow drift with the angle blade it darts in the left direction. So I just let it plow on and slowly correct the course because I don't want to start turning with the steering levers for it takes power away from the tracks. This works very well and not hard on the little machine but the trail I made looked like a mouse maze. I traveled about 5 km till I came to the big ice ridge, wow has it ever changed since I drove through it with the "THE HOOD". There is now an ice ridge heading south east and the main ridge itself seems taller. Once I plow a little past the ridge for safety, I turn the "CURSE OF REVERSE" around and start plowing more snow off the just plowed trail. Some of those drifts stopped the little cat dead, but no problem just back up and hit them again and again. When I return to where the sleighs have been sitting for the last 2 days, I hook up to the Southern stone boat. This is one hard pull for the little cat but I just putt along as best as I could until I'm on the other side of the ice ridge and spot the stone boat for the night. Next I head back and hook onto the sleigh overloaded with lumber, the little cat pulled this sleigh with ease, in fact I was 2 gears higher then pulling the Southern stone boat. Southern Belle and Xena were glad to get the caboose to move to a different location by the ice ridge, as Southern Belle says any change of scenery is good. So after a goodnight sleep, all we have to do is make the lodge and unload the sleighs. Everything is going good and the little cat known as "CURSE OF REVERSE" is doing very well pulling such big loads. 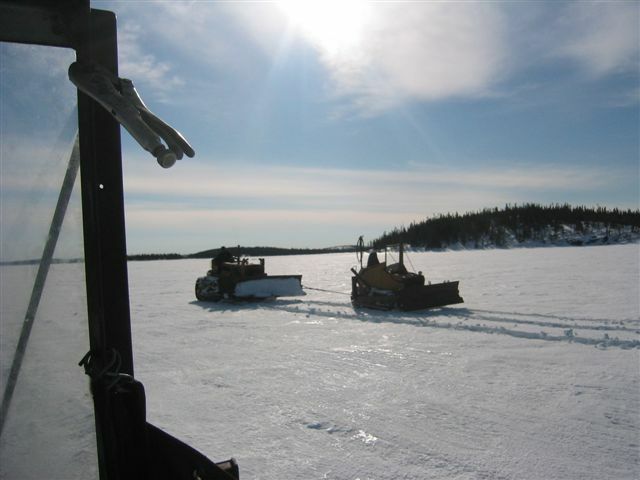 Until, I get the loaded lumber sleigh stuck on a little sand bar that sticks up through the ice. 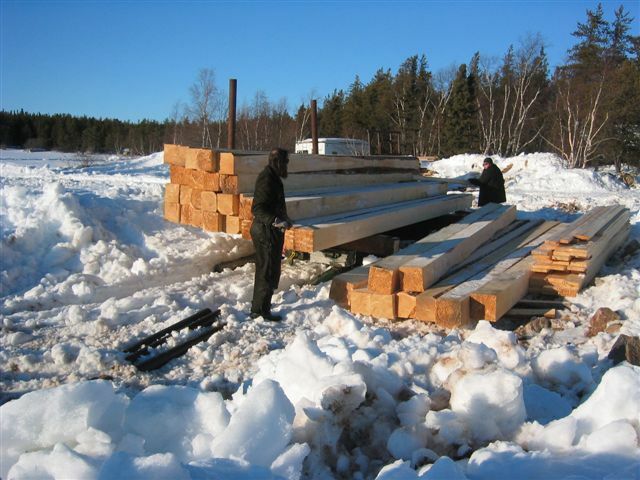 This is not good because now we have to unload 1/2 the lumber on to another sleigh to get the lumber sleigh off the sand bar. We were so close, we could have thrown the lumber to the lodge. Oh well, more work to kept us slim and trim. Once the sleigh is 1/2 unloaded the "CURSE OF REVERSE" gets the sleigh off the sand bars and I'm able to run the sleigh to shore until the little cat can't pull it any more. Then we get to unload the rest of the lumber in which Xena takes a picture of the "KING" and Southern Belle. In this picture it shows how big my bald spot has gotten in the last 2 years. The joys of getting old is having a bald spot, while the hair in other places grows thicker and faster. Oh well!. After working late in to the night unloading and getting a snow ramp ready to load the empty sleighs on to the deck sleigh. I pop the track off the "CURSE OF REVERSE" in really deep snow and of course in a rock garden! What fun we had putting the track back on being so tired and hungry. When we hit the pillows that night in the comfy caboose our eyes were shut now. So the next morning we get up stiff and sore due to all the lumber we had hand bombed off the sleighs. 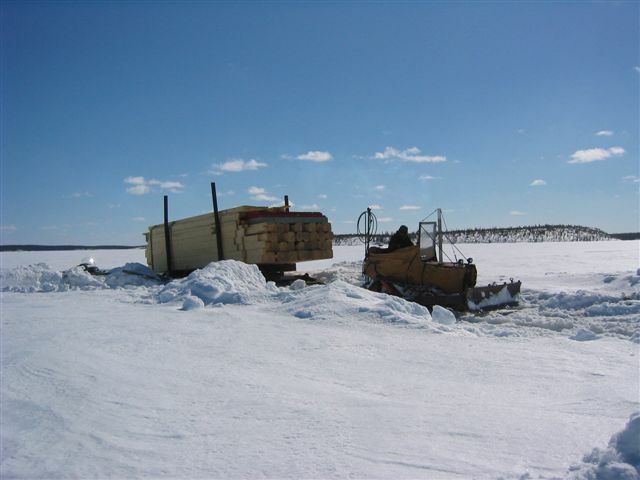 We get the Cat Train ready to head back across Reindeer Lake to where "THE HOOD" and "KOMMUNIST KAT" were left broken, 6 miles from Kinoosao, Sk. The King of Obsolete is driving the td-6 international crawler known as "CURSE OF REVERSE" with Southern Belle and Xena in the Freighting Caboose as we leave Tate Island Lodge. I got the td-6 in high gear which we call putting the "hammer down" and make good time heading back across our Cat Train Trail to where the other cats are. We spent the night and in the morning we fired up the "THE HOOD" and pulled the "KOMMUNIST KAT" backwards cabled to the blade of the big D6 9U. What a sight to see, 2 cats going backwards for 6 miles to Kinoosao, Sk, but it worked and I would do it again. There are no big tow trucks that would come and give me a tow. Southern Belle drove "CURSE OF REVERSE" pulling the Cat Train with Xena in the freighting caboose. We made Kinoosao, Sk. and loaded up the caboose on the Linn Tractor trailer behind the "Ford Dually" and left the cats for buddy Barry's lowbed to haul at a later date. We thought only 2.5 hours and we would be back in the "KINGDOM", wrong! The hard packed snow had melted on the road and the "Ford Dually" was spinning on every hill, even with all the tires chained up. We even had to back down and try a couple of the hills 2-3 times before we made it over the top. So 8 hours later we are back in the KINGDOM" for the first hot bath in a week. The bath felt good and we never even bothered to stop by and see what the boys at the "Table of Truth" had to say on this adventure. I know those guys would have been in worse snow conditions, had a smaller cat and heavier loaded sleighs.